5. Lecturer in Information Technology - 01 Postகல்வித் தகுதி :1. Administrative Officer - Degree from a recognised University/Institute. Three years experience of Accounts, Administration and establishment work in a Government Office/Public Sector Undertaking/Autonomous Body/ Statutory Body. 2. Lecturer in Applied Mechanics - Bachelor’s degree in Mechanical Engineering with first class from a recognized university. If the candidate has a Master’s degree in Mechanical Engineering, first class is required at Bachelor’s or Master’s level. 3. Lecturer in Chemical Engineering - Bachelor’s degree in Chemical Engineering/Technology with first class from a recognized university. If the candidate has a Master’s degree in Chemical Engineering/Technology, first class is required at Bachelor’s or Master’s level. 4. Lecturer in Civil Engineering - Bachelor’s degree in Civil Engineering/Technology with first class from a recognized university. If the candidate has a Master’s degree in Civil Engineering/Technology, first class is required at Bachelor’s or Master’s level. 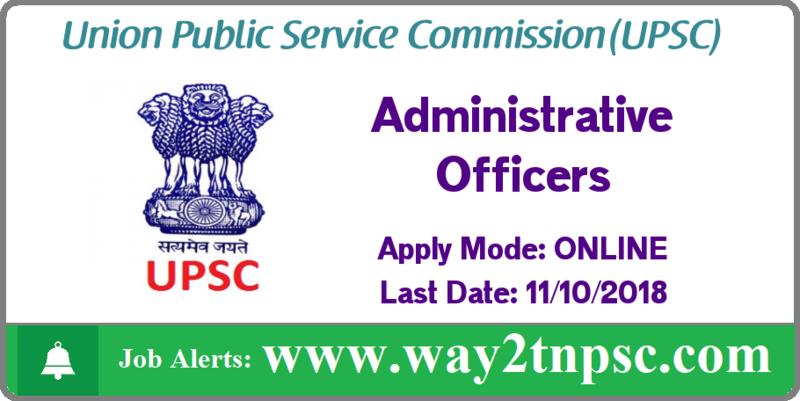 Union Public Service Commission(UPSC) Recruitment 2019 has been announced for the below vacancies. Read the following Job Notification details to get a clear idea about Registration process, Eligibility, Qualification, How to apply, No of Vacancies, Salary, Job Location, Links to apply, Selection procedure, age limit and all the instructions before applying for this job. Click the FACEBOOK ICON below To get Alerts of All Job Notifications from WAY2TNPSC Interested and Eligible Candidates can apply before 11-Oct-18. Keep on reading this page to know all the above details. So, it will be helpful to know the procedure and details for the candidates who wish to apply for this particular vacancies. 5. Lecturer in Information Technology - Rs. 15600-39100/- plus AGP Rs. 5400/-Education Qualification :1. Administrative Officer - Degree from a recognised University/Institute. Three years experience of Accounts, Administration and establishment work in a Government Office/Public Sector Undertaking/Autonomous Body/ Statutory Body. The above Notification ( UPSC Recruitment 2018 for AO, Lecturer Posts | Apply online ) briefly describes about the details of latest announcement or notification includes important dates like release date , last date of application submission, details regarding fees, exam timings. Candidates, check all the needs and apply accordingly.